Filmmaker Steven Spielberg surprised the audience -- and, from the looks of it, quite a few of the musicians -- at Benaroya Hall Wednesday night when he appeared for a Seattle Symphony concert with conductor John Williams. 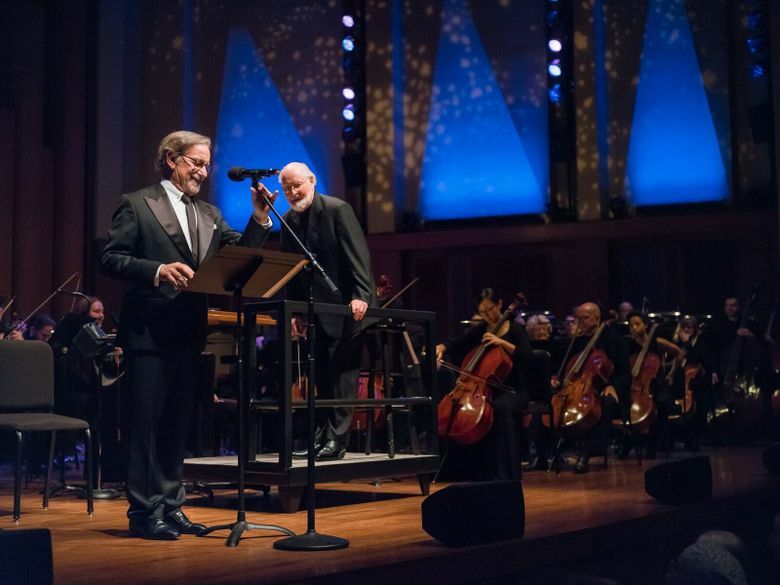 Filmmaker Steven Spielberg surprised the audience — and, from the looks of it, quite a few of the musicians — at Benaroya Hall Wednesday night when he appeared for a Seattle Symphony concert with conductor John Williams. The appearance had been in the works for a couple of months — though even within Seattle Symphony, few knew that it was happening, said symphony spokeswoman Shiva Shafii. Spielberg and Williams had appeared together before at symphony concerts in other cities including Atlanta and Phoenix. But in those cities, people knew Spielberg was coming, Shafii said. Spielberg had initially been unavailable to come to Seattle for the Williams concert, but about two months ago, the Symphony got a phone call that he would be available. The Symphony decided to keep the appearance a secret from the audience and even from many of those working at the Symphony. “An added element of surprise — who doesn’t love that when they come to a show,” Shafii said. The Williams concert, a Seattle Symphony subscriber exclusive, sold out shortly after tickets became available, Shafii said.